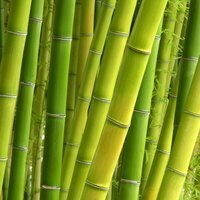 Contrary to what many people think, bamboo is a grass, not a hardwood. This classification deems it an opportune medium to weave into baskets. Bamboo is durable and is a sustainable material as some species can grow more than a yard in one day. Bamboo baskets can be decorative or can serve as a place to store magazines, craft supplies or other items in your home. The basket will take many hours, but you can always work on it in your free time. Cut a 3-foot piece of bamboo vertically into four planks using a large knife. Cut each plank in half. Divide the halves into layers, starting from the backside of the bamboo. Snip the ends of the bamboo strips with scissors, if needed, so they are all equal lengths. Peel the bamboo strips to separate and create more strips of bamboo. Unroll and cut a 5-foot piece of string. Thread the tapestry needle with the string. Gather three pieces of bamboo and wrap the loose end of the string around the end of the bundle. Wrap 3/4 inches of string around the bamboo. Curve the bamboo into a U shape and wrap the string around both sides of the U six times to secure. You will have a small loop. Bend the loose end pieces of bamboo around to where they lay along side the loop. Stitch around the bamboo pieces and through the loophole with the tapestry needle. Use a whipstitch while keeping the stitches close and next to one another. Make about 10 to 20 stitches or until you have made a complete circle around the loop. Pick up another three-piece bundle of bamboo. Add it to your basket by placing it underneath the loose bamboo that is protruding from the ring. Wrap the string around the combined bamboo bundle six times. Wrap the string around the bamboo and the coil of the previous row by inserting the tapestry needle through the coil, over the bamboo bundle and back through the coil. Continue to add bamboo this way until you have reached your desired size of basket. Create sidewalls by sitting the upcoming row or bundle on top of the previous coil as opposed to the coils being adjacent. Build the rows on top of each other to build height. Wrap string around the top coil of the basket to finish the basket off. Measure out 6 inches of string from the end of the basket and cut. Tie a double knot in the string as close to the basket as you can get. Snip off the end of the string and use the needle to tuck the knot into the bamboo coil.